Konica Minolta Business Solutions, a leading global provider of advanced imaging and networking technologies, has recently installed AccurioLabel 190, its state-of-the-art digital label printing solution, at Hora Art in India. The Hora Art installation marks the first roll-to-roll label printing installation made by Konica Minolta India and further strengthens the company’s domain leadership position in the country. A compact, high-performance digital label printer, the AccurioLabel 190 from Konica Minolta operates at the optimal intersection of performance, quality, and cost. It uses dry toner electrophotography to deliver outstanding high-quality images. The AccurioLabel 190 ensures extremely accurate image processing and formation for industrial printing requirements; the print quality is as high as the most high-end digital label printers and is comparable to offset printing. The AccurioLabel 190 also boasts of the highest speed and most stable printing performance in its class with per-minute speeds of 18.9m, 13.5m, and 9.45m, depending on the paper type. It can handle a wide range of media such as ordinary/matte paper, glossy paper, tack paper, synthetic paper, and film with paper thickness of 60-250 micron and maximum input width of 330 mm. All of this makes the AccurioLabel 190 perfect for new-age label printing operations such as small-lot printing, VDP, and barcode printing. The AccurioLabel 190 is equipped with advanced colour adjustment software, allowing it to deliver consistent, stable, and superior quality output from sample production to actual production. This enables the AccurioLabel 190 to ensure higher productivity and better profitability, even for small-lot printing. “Through our range of offerings, Konica Minolta aims to deliver best-in-class productivity, profitability, ease-of-usage, and cost efficiency to its customers, while enabling them to cater to the ever-evolving print requirements of the digital age. The installation was followed by a grand inauguration event at the venue on August 9, 2018. 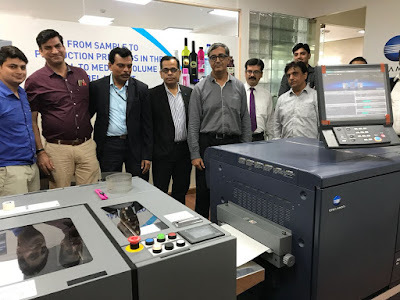 At the event, Vijay Kamat, Product Manager IP and Shayak Mukherjee, Business Consultant R2R interacted with the media to discuss the differentiation that the innovative solution delivered for print and printing businesses.